I just haven’t had any inspiration to draw for a few days so I made myself go out and sketch in the town centre this afternoon. Black and white only today, with some rather suspect perspective, but it feels good to have overcome the blank page. Daily life presses the inspiration to the back of the line at times, doesn’t it? I know Many times I have to force myself to get started, and then I marvel at how much better I feel… I think waiting for inspiration, for me, is like waiting for a pretty disorganized bus that might or might not come! After a lot of years I have the art habit, that seems to carry me on through those times now. 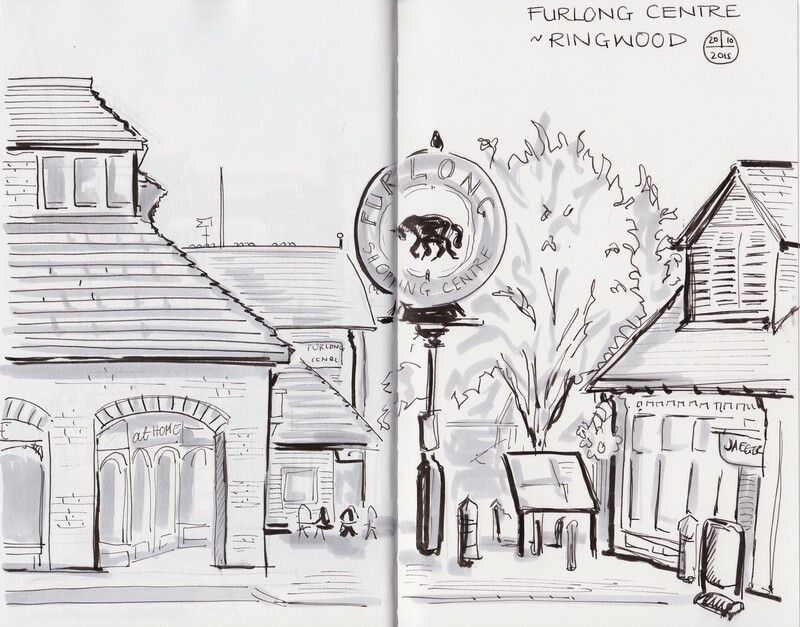 I like this drawing and I compare it to my local area (a suburb of Philadelphia) – it looks like home to me! I like the sparing use of the heavier black lines, too. You are so right Claudia. I like the bus analogy!